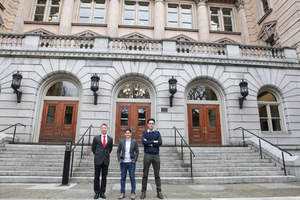 From left, Donor Resources Representative Josh Jacobs, Regional Director for Oregon and Southwest Washington Andrea Chiller and Donor Resources Representative Joe Wilson stand in front of the new Bloodworks Northwest office, at WeWork in the former U.S. Custom House in the Pearl District. PORTLAND, OR--(Marketwired - Feb 17, 2016) - Bloodworks Northwest, a nonprofit blood collection and distribution organization, has opened a new Portland office as it continues to support local patients and hospitals in Oregon. 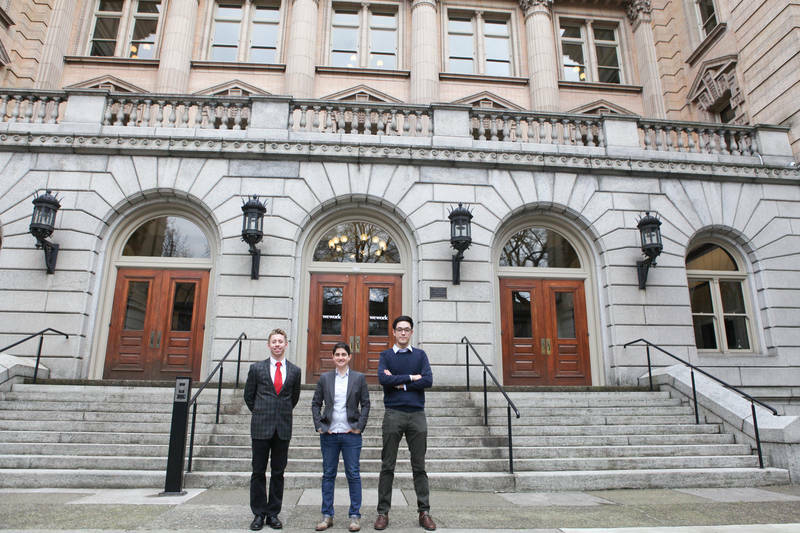 The organization announced today that it has opened an additional office in the Pearl District. Until now, Bloodworks' Portland operation was supported by a donor center in Vancouver, Wash., a blood lab at Providence Portland Office Park and the mobile donation buses it provides for local blood drives. "Expanding to the downtown area brings us a significant step closer to the full-fledged donor center we hope to establish in Portland," said Andrea Chiller, Bloodworks Northwest's regional director for Oregon and Southwest Washington. "As a community-based nonprofit, we only collect blood in the areas where we already support patients and hospitals, and so it's especially important for us to have a presence here in Portland, where today we provide more than half of the donated blood used at local hospitals." While the Red Cross is historically the name that comes to mind when Oregonians think about blood donation, it's actually Bloodworks that supplies a majority of the lifesaving blood components used by patients and hospitals in Portland and the surrounding metro region. That includes 36,000 pints of blood used at Providence and Legacy facilities in Oregon each year. Bloodworks also provides most of the donated blood used at hospitals in Lane and Douglas Counties in Southern Oregon. Bloodworks' new Portland office is located at the WeWork building, which provides space for multiple companies in the former U.S. Custom House at 220 NW Eighth Ave. The local landmark has made cameos in a number of movies and television shows, including NBC's "Grimm." The new Portland Bloodworks office will include Chiller along with two donor resources representatives, who will be reaching out to employers and community groups in the Portland area who would like to set up blood drives that support local patients. In addition to collecting and distributing blood, Bloodworks offers scholarship programs for students, advances transfusion practices, helps to educate the next generation of doctors, provides treatment and support to people with blood and bleeding disorders and operates a leading blood research institute seeking cures for thrombosis, a leading cause of heart attack and stroke. To learn about holding your own blood drive, contact Chiller at 503-530-9253 or AndreaCh@BloodworksNW.org. About Bloodworks Northwest: Formerly Puget Sound Blood Center, Bloodworks is backed by more than 70 years of Northwest history and 250,000 donors. A national leader in transfusion medicine, Bloodworks has been chosen to serve more than 90 hospitals in Washington, Oregon and Alaska -- partnering closely with local hospitals to deliver the highest level of patient care. Patients with traumatic injuries, undergoing surgeries or organ transplantation, or receiving treatment for cancer and blood disorders all depend on our services, expertise, laboratories and research. We are local, nonprofit, independent, volunteer-supported and community-based. For more information, visit bloodworksnw.org.